Chris Gard, the father of critically ill baby Charlie Gard finishes reading a statement next to mother Connie Yates, right, at the end of their case on Monday at the High Court in London. The parents of critically ill baby Charlie Gard dropped their legal bid Monday to send him to the United States for an experimental treatment after new medical tests showed that the window of opportunity to help him had closed. LONDON — The parents of Charlie Gard, whose battle to get their critically ill baby experimental treatment stirred international sympathy and controversy, dropped their legal effort Monday, saying tearfully that it was time to let their son die. At an emotional court hearing, a lawyer for the baby’s parents, Chris Gard and Connie Yates, said the couple was withdrawing a bid to have Charlie sent to the United States, where a doctor had offered to try to treat his rare genetic condition. The decision came after new medical tests showed Charlie, who has brain damage and cannot breathe unaided, had irreversible muscular damage. Both parents wept in the packed courtroom at the High Court in London as lawyer Grant Armstrong made the announcement, his voice breaking. Gard and Yates, who are in their 30s and from London, have fought ferociously for their son, who was born in August 2016 with mitochondrial depletion syndrome, a rare genetic disease. The baby has been treated at Great Ormond Street Hospital in London, one of the world’s leading children’s hospitals. Doctors there say Charlie is in pain and further treatment would only increase his suffering. They have sought permission from the courts to switch off his life support and allow him to die peacefully. His parents have resisted, arguing that an experimental treatment could extend and improve Charlie’s life. The case gained international attention after Charlie’s parents received support from Pope Francis, U.S. President Donald Trump and some members of the U.S. Congress. U.S.-based pro-life activists flew to London to support Charlie’s parents, as the case became a flashpoint for opposing views on health-care funding, medical intervention, the role of the state and the rights of the child. Passions have often run high, with activists demanding “justice for Charlie” rallying outside the High Court and Great Ormond Street Hospital. Over the weekend, the hospital said it had contacted police after staff received abuse and threats. Charlie’s parents condemned the abuse, and on Monday thanked the hospital for the care it had given their child. Some commentators portrayed the case as a clash between family and the state, and U.S. conservatives used it to criticize Britain’s government-funded health care system — even though the case was never about money. At its heart, the case pitted the right of parents to decide what’s best for their children against the authorities’ responsibility to uphold the rights of people who can’t speak for themselves. Under British law, children have rights independent of their parents, and it is usual for courts to intervene when parents and doctors disagree on the treatment of a child — such as cases where a parent’s religious beliefs prohibit blood transfusions. British courts and the European Court of Human Rights all ruled against Charlie’s parents and in favor of Great Ormond Street. The case returned to court this month when the hospital asked the judge to reassess the possible benefits of a treatment pioneered by Dr. Michio Hirano, a neurology expert from Columbia Medical Center in New York. At a hearing earlier this month, Hirano said there was a 10 percent chance of a significant improvement in Charlie’s muscle use with the treatment, known as nucleoside therapy. But he conceded it had never been tried on humans, or even on mice with Charlie’s exact condition. Hirano came to London last week to examine Charlie along with other experts. After seeing the results of new tests, the baby’s parents agreed to drop their case, meaning Charlie’s life support can now be removed. But they still believe Charlie could have been saved had months not been spent in legal wrangling about whether he should get treatment. “Had Charlie been given the treatment sooner he would have had the potential to be a normal, healthy little boy,” Yates told the court. The hospital disagreed. Its lawyer, Katie Gollop, said Charlie had suffered “irreversible neurological damage” and the treatment would have been “futile.” She said the hospital stood by its belief that Charlie was in pain. Ending a case he called tragic for all involved, the judge paid tribute to Charlie’s parents, saying it was impossible to comprehend the agony they faced. Yates cried as she told the court she and Charlie’s father had only wanted the best for their son. “We are so sorry that we couldn’t save you,” she said. 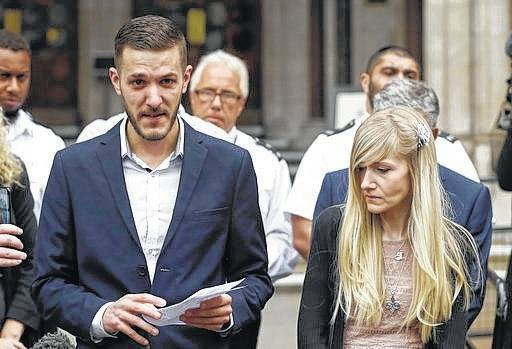 https://www.delgazette.com/wp-content/uploads/sites/40/2017/07/web1_CHARLIE-GARD.jpgChris Gard, the father of critically ill baby Charlie Gard finishes reading a statement next to mother Connie Yates, right, at the end of their case on Monday at the High Court in London. The parents of critically ill baby Charlie Gard dropped their legal bid Monday to send him to the United States for an experimental treatment after new medical tests showed that the window of opportunity to help him had closed.